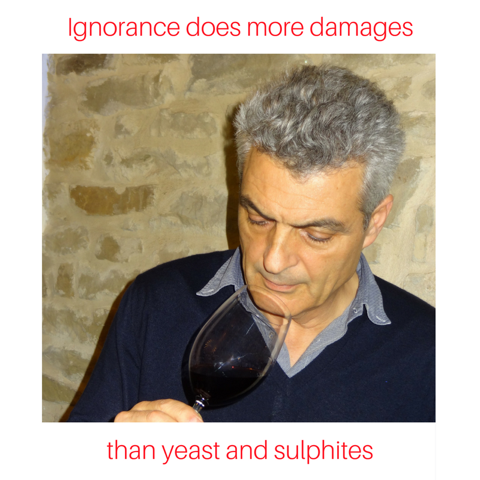 Ignorance does more damage than yeast and sulphites. I wanted to thank everyone for the interest in my post. More than a train of thought, it came out of me like a flooded river, and I’d never have expected this massive response, so wide and passionate. Many people asked me to translate this article. Here goes the English version, my contribution to Italian wine making. Inspired by some reflections and comments recently posted on social media, I have decided to further explore some issues that I particularly care about and which I can no longer ignore. In recent days, an interview with a wine producer advocating natural wines was widely published. The interviewee disagreed with those producers of natural wines who see in organoleptic defects a distinctive symbol of their naturalness and territoriality. At the same time, while defending the good management of the cellar, he expressed his disappointment with producers who use selected yeasts and / or various additives in winemaking. The gist of the article was, in some way, to argue that defects, as well as the use of additives, alter the originality of a wine and its link with its territory. This point of view, among the least extreme in circulation, is becoming the dominant theme among many wine lovers. Unidentified phantom “experts” fuel this controversy, subjecting wine entrepreneurs and winemakers to harsh and often unfair criticism. In my 30 years of winemaking activity, I have been able to enhance and enrich the production techniques for wines produced with grapes grown in bio, biodynamic and conventional agricultural methods. I have worked on wines without added sulfites, without the use of selected yeasts, on so-called “industrial” wines and wines marketed with bottled sediment. I believe I have had a good amount of experience, but I am still not satisfied and I don’t believe I have yet “arrived” as a fully formed and perfected enologist. Indeed, I am so passionate about this work that I continue to read and study because there are too many gaps that science still can not explain in the understanding and development of fermentation chemistry and conservatives of wines. It hurts me to see legitimate enology work generally criminalized by people who haven’t got the faintest clue about enology and the complicated science involved. As a winemaker, I am delighted to believe that, among the producers of natural wines, we are finally recognizing defects for what they are: they do not express a territory but rather debase it. Many people, however, including some strong opinions and even those who are moved to scream their beliefs, attempt to elevate defects and seek to discover new “rising stars” in this category. The flaw, as a famous colleague says, is identifiable anywhere and everywhere; therefore, besides being debased, it is also in danger of becoming something of a negatively validating characteristic. These are not new themes: over the years there have been “deified” wines that manufacturers bottled without any control so, if you happened to buy or order a bottle that had an undesirable malolactic fermentation in the bottle, or was refermented due to residual sugar poorly controlled, woe betide any criticism you voiced because you were immediately marked as barbarous and ignorant, paradox of paradoxes. While I agree on recognizing that defects are flaws, I can not share the concept that a wine, to be original and representative of its territory, must be produced without the use of adjuvants and / or additives. I recognize that in some mass wines, from which I distance myself, it can be an exaggerated use, to the detriment of the final product. If, however, someone tried to unravel all the themes, the ABC of biology, chemistry and all the phenomena that are the basis for the transformations that lead us to produce a wine, maybe it would be more to the point to simply recognize that the biological engine that allows us to vinify must be guided by the hand of man. The natural evolution of grapes, the reproducing from seed to vine, the transformation from grape to wine: this end result is a direct product of the desire and labor of human beings. In Nature the necessary chemical and biological reactions necessary to produce wine do not exist except for a brief intermezzo during the biological deterioration of the grape berry. The grapes grown in a vineyard located in a specific territory constitute only one element of the equation. The autochthonous vine is another crucial element, but only if well selected. The use of selected yeasts, those identified as fast and safe fermentation activators, the use of malolactic bacteria, perhaps obtained from storage in the cellar in the previous year, the use of sulphites in a correct and non-invasive way, none of these are inherently good nor bad on their own. The barrique and the wooden container are usually designed for one purpose: to refine, clear and naturally stabilize the wine, not to color it with a taste of wood! All of the above are techniques and tools that man has devised over the centuries to improve and make wine available over time. I do not see anything wrong with this, on the contrary, I think it is the ideal way to elevate the value of a specific wine in a specific territory, as long as they are used in harmony with the contribution of careful and targeted viticulture, together forming an indissoluble bond. This is the challenge for the future of Italy: to emerge on the global market by linking our wines to their unique territories, and uniting our history, our gastronomic and our cultural heritage. Today, more than ever, it is crucial to have a common consciousness to impose on an increasingly difficult and complex market. Reducing the problem to simply thinking that selected yeasts are negative is off topic and counterproductive. While it is true that strains of yeasts have been selected that characterize and generalize the bouquet of a wine, it is also true that there are many selected yeasts which are only good fermenters and do not affect the original characteristics of the grapes. The choice is wide. Let’s just think for a moment about the production of Champagne, or sparkling wine from any area of the world today. How would modern production be affected if there were no selected yeasts? Many of these were specifically selected to achieve unique, inimitable results in the wines, without distortion, and to enhance them and their natural characteristics. What about the selection of so-called “spontaneous” yeasts fermenting the musts of those “natural” producers in the cellar environment? These are micro-organisms that are dormant in their cellars (not in their vineyards!) and awaken in contact with the musts and spread throughout the harvest and then return to a dormant state. In a winery there is no single yeast that begins and completes a fermentation process, even those selected can do this. By the way, I say to all of you who claim to the contrary, have you never done microbiological research to understand who they are and what their leavening agents have? I can tell you that, if you investigate genetic maps of those “indigenous” strains, you would discover that those yeasts are also marketed and sold as good wine-makers. You would find the common Saccharomyces Cerevisiae, the microorganism belonging to the vegetable world, a fungus, the agent of fermentation. You would also find apiculture yeasts, negative “dangerous” yeasts, not because they are monsters, but because in certain environmental conditions they prefer to eat things other than sugars, and this “other” is a problem, a defect 9 times out of 10. Essentially, proper scientific research will allow non-believers to discover the truth for themselves: that what they say is without scientific and intellectual foundation. As I said, I tried to vinify grapes and refine wines without using sulfites over many harvests. The conclusion I have reached is that wine can be produced this way, but with a qualitative result that lacks personality. Due to an oxidative effect, the perfumes are lost, thereby making the wines insignificant compared to the traditional ones. To date, there is no technique that allows the production of fine wines, especially wines intended for long ageing, without the use of this complex additive that acts as an antiseptic, a preservative and a stabilizer. At what price then? Because if you really want to avoid its use you should use other additives such as tannins, tannins and tannins. What about white wines without the use of sulfites? Impossible! It’s true: added sulfites can be annoying and even toxic. If used wisely, however, sulfites do not cause all the upset we hear about from uninformed sources. The legal limits of sulfites have been lowered in wines in recent times and are subject to continuous downward adjustments as the experience of the operators grows, but it is not currently possible to do well without them. To those who dispute the use of sulfites, I would like to ask if you buy and consumes fresh crustaceans, mustard, pickles, vinegars, sauces in general, etc.? One wonders how many added sulfites there are in most of the stored foods? And when you take into account the maximum ingestible dose per kilogram of sulfites, do you ever consider the total amount of sulfites ingested through all foods consumed? Even a simple can of Coke and potato flour in gnocchi contain sulfites. It is far too easy to talk about important subjects without taking the time to actually know what you’re talking about! Why should we always think that research, study and those who try to apply the fruit of this work are dangerous, speculators, terrorists who want to poison the next? I am an enologist and I try to make the most of my clients’ wines, working on the specific qualities of the grapes they produce in their specific territories. I use a few carefully selected adjuvants and only when they are needed. Despite this, you can not find a common identity among all the wines I work with, going from the North to the South of the Boot and for this I do not I think I’m an “Alchemist”: I think I’m just a good “Craftsman” who uses Nature and the techniques that Science gives me to do my job well. Not only that, I consider myself lucky. Many of my colleagues can not say the same because in the wine market there are not only famous wines, there are also normal wines, those that are drunk every day, as you drink a simple beer; because there is also a consumer who sometimes wants only to enjoy a good wine without pondering the nuances of whether he is drinking a Cabernet or a Sangiovese. There are novice consumers who have to educate their palates, beginning with simple wines, in order to begin to approach important wines. Simple wines are not poisons! These are wines obtained from Grapes! Their musts are vinified with modern and reliable techniques using also simple adjuvants and authorized food additives to obtain also “perfect” and “pleasurable” wines. Should we leave this market? Should we tell thousands of traders to change jobs because someone who knows nothing of science and technique, knows nothing of tradition and development, has the audacity to say they think these traders are doing something wrong? They think these traders are pursuing a business against nature? Wine must be considered in all its qualitative and commercial variants, particularly from a country that is the world’s leading producer. Italian wines are unique in the world for the profound range of their autochthonous varietals, the unique qualities found in climactic and territorial diversity in a country smaller than the state of California, the millennia of oenological history and the deep rooted passion, labor and dedication which continues to provide the grounding for all Italian wine endeavors. If technology allows us to keep costs down and be competitive even on the cheapest price ranges, there’s nothing wrong with that. There is room for everyone in the market and our aim must always be to improve. Making war for a handful of yeasts seems to me a way focusing on an irrelevant scapegoat and diverting our focus and attention from far more important questions. I conclude by pointing out that my reflections as a professional are mainly a heartfelt effort to lend a potentially helping hand to those who turn to the world of wine with curiosity, passion and competence, who seek information and development, and with whom I can not wait to compare myself constructively in all my future work.